He’s the Wiz and Nobody Beats Him! It takes balls to follow up Victor Fleming’s 1939 masterpiece The Wizard of Oz. A classic in so many ways – from its astonishing visual storytelling to its iconic characters to its oft-belted songbook – the film remains among the most beloved in American moviedom. More importantly, it introduced perhaps the greatest villain in cinematic history, the awe-inspiring Wicked Witch of the West. Director Sam Raimi sets out to prove he has a pair with Oz: The Great and Powerful, a prequel to the classic that details the wizard’s earliest escapades in Oz. Beginning and ending with its pop-up book inspired credits, Raimi’s film boasts a hokey visual charm appropriate for its vaudeville-esque hero. Raimi employs state of the art technology to wow in the way inventive backdrops filmed with brand-spanking new Technicolor caused jaws to drop in ’39, forever imbuing his cutting edge visuals with an enjoyably retro quality. 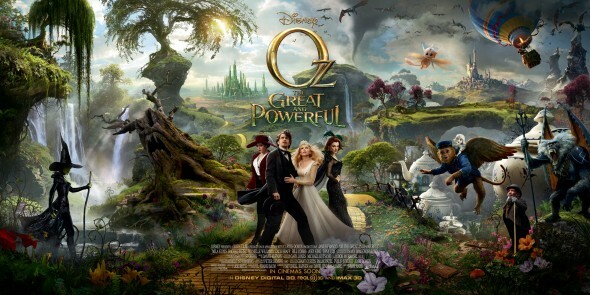 Oz also mimics its predecessor’s format: opening in black and white Kansas, introducing characters that will feel oh-so-familiar once we’re in the topsy turvy land of Oz, before landing in the hyper-saturated color and 3D majesty of fantasy. Still, it’s not just the visual element that made the original a classic, and 2013 audiences are pretty used to being wowed visually. What else has Raimi got? A pretty impressive cast, actually, though few feel right for their characters. Oscar winners and nominees mix with established character actors to populate the overripe landscape, but most of them are filling some pretty big shoes. A likeable James Franco keeps you interested, but he lacks any real sense of showmanship or seediness as the morally conflicted Oz, carnival shyster turned powerful wizard. The always wonderful Rachel Weisz comes off best as the intriguing enchantress Evanora. The also extravagantly talented Michelle Williams really struggles, however. She tries to keep Glinda’s spirit intact without becoming too restricted by Billie Burke’s originating (let’s be honest, annoyingly sugary) performance. I’m not sure she succeeds. It’s Mila Kunis, though, who stumbles most – a crippling misstep in casting. But Raimi gets points for the sheer joy in his storytelling and his effort’s obvious love for both its predecessor and the work of writer L. Frank Baum. The vividly animated adventure offers enough energy and entertainment to shake off these snowy March weekend blahs. It will hardly stand the test of time the way the original has, but it’s a fun way to waste a couple hours right now. You Got Some Explaining to Do!